Successfully Added Compact Multi-Card Reader (USB 2.0) to your Shopping Cart. 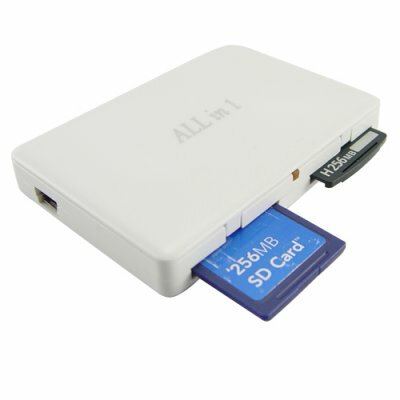 Compact Multi-Card Reader (USB 2.0). A sleek, compact Multi-Card Reader presented in a high gloss white for a professional look. Capable of reading virtually all of today's popular digital media formats, this USB 2.0 memory card reader is the ideal companion for your digital media. You will find that this ultra-portable MultiCard Reader is the fastest and most convenient way to transfer your favorite images, music and data to your PC. So why clutter up your desk with different card readers and adapters when this single compact solution will efficiently address all your card reading needs? This reader supports a wide variety of memory card formats including SD, CompactFlash (CF), Multimedia (MMC), SmartMedia, and the Sony Memory Stick family. Enjoy full compatibility with the USB 2.0 standard, the Compact Multi-Card Reader (USB 2.0) - Ultra Slim version is also backward compatible with USB 1.1 ensuring that it works with all computers. This Card Reader is extremely user-friendly and easy to use. Effortless installation with Plug and Play functionality with no need to restart the computer. The digital card reader also features a handy LED light to indicate power and media access status. Would be ideal for portable use on the road, or at home with a desktop or laptop. Providing outstanding performance, this is a fast and easy way to transfer photos from most popular digital cameras on the market and other digital devices; this reader has the ability to read all popular memory card formats. The fastest, easiest way to transfer images, music, and data to your computer. Powered by USB connection cable. No external power source required. Does this product require any special software or drivers to run? No.